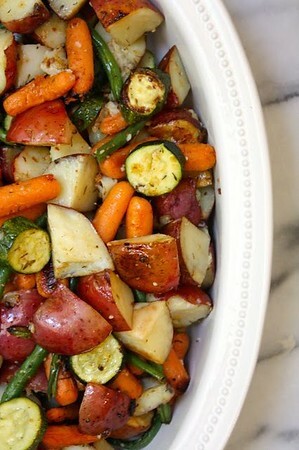 I went to make these roasted veggies again this week and realized I have never posted the recipe here...which is crazy because I make these all the time! I don't even remember where I initially found the recipe, but it was part of a complete meal and the veggies were what spoke to me so I make them as a side often now. My favorite combo for the veggies is 2 zucchini, 1 russet potato, 1 red bell pepper and 1 red onion (or at least 1/2 of one). We typically serve it with pork loin but they are good with any type meat or even by themselves! Chop up your veggies of choice and mix with marinade until well coated. Spread on a lined baking sheet and bake 20 minutes. Stir around the veggies and bake an additional 10-15 minutes.